A Cartoon Guide to Becoming a Doctor: Buy A Cartoon Guide to Becoming a Doctor today! Buy A Cartoon Guide to Becoming a Doctor today! Do you think becoming a doctor is funny? Yes, me too. Medical school? Hilarious. Residency? Hilarious. Doctors? Really hilarious. And have you ever wished somebody would take all that funny and draw a bunch of cartoons about it and then make it available in book form? That's right! 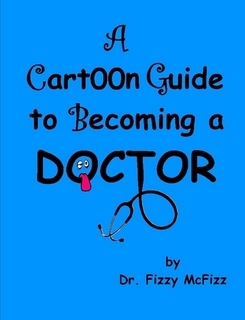 A Cartoon Guide to Becoming a Doctor is now available in handy book form from Amazon and from Lulu for only $12.99! Should you ask a question in lecture? Buy it now from Lulu or from Amazon or as an EBook. 1) Great present for your nephew who just graduated from med school, and he already has a stethoscope, so you can’t buy him that. 2) Can be placed strategically on coffee table prior to hot date with cute doctor who lives next door. 3) You bought Jorge Cham’s PhD book and all his comics are online. Plus you bought that book with all the funny cake mistakes. Gosh, when you look at it that way, how could you NOT buy this book?